Why doesn’t Thunar use your icon theme’s folder icons? 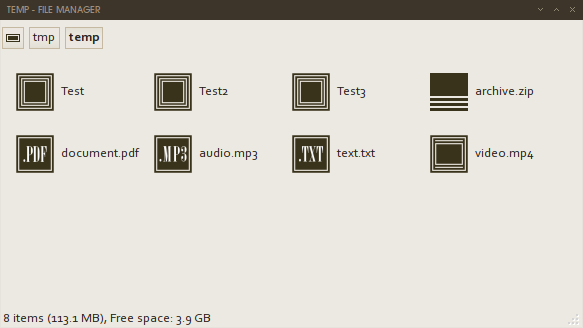 Other file managers–Nautilus, Caja, PCManFM–use your theme’s folder icons, but Thunar refuses to obey. The official Xfce documentation gives you a few workarounds, but you quickly realise these are outdated and don’t have any effect. Adjust this command to your needs. Make sure you replace my-icon-theme with the name of your icon theme (for icon themes installed as root, look for them in /usr/share/icons/my-icon-theme). Also double check what file type your icons are. Many icon themes use .svg files (scalable vector graphics), instead of .png files (portable network graphics) as in the above example. Once that is done, relaunch Thunar, and your directories will use the folder icons of your chosen theme. I still use Openbox daily, but recently decided to finally give some of the big desktop environments a serious try. The last time I really tried Gnome or KDE was before their big shifts (to 3. and 4. respectively). A friend had been speaking highly of the latest Gnome versions and claimed several features of it enhanced his workflow and productivity. Was I missing out on all these great developments by sticking with Openbox? I gave Gnome and KDE another try, using them for my usual work for a few days each. There are indeed some nice features in these newer versions, and I particularly liked some of the new aspects of KDE. But I am now back with Openbox, because I feel so much more at home in it (having spent a few years fine tuning a desktop that suits my needs), and because I still don’t understand why I need to spend so much of my laptop’s resources on window and desktop management (resources that are not a plenty with older laptops!). 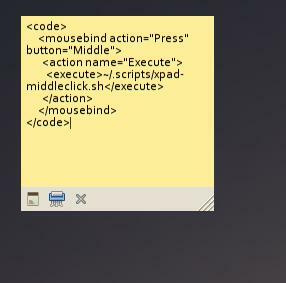 One feature of KDE I particularly liked: middle click on the desktop and the text in your primary X clipboard (the clipboard that contains the text that is merely highlighted, and that is normally pasted with a middle mouse click) is pasted into a new note on the desktop. Very handy for information you quickly want to store somewhere (for however long you want to)! When I moved back to Openbox, I immediately decided to implement that in my Openbox desktop, using xpad. Here is how I did it. Save the script (I saved it as ~/.scripts/xpad-middleclick.sh), and make it executable (chmod +x ~/.scripts/xpad-middleclick.sh). Reconfigure Openbox, and you can quickly create an xpad note of the selected text whenever you middle click on the desktop.